Japanese are different because they always can do something amazing of the simple products. 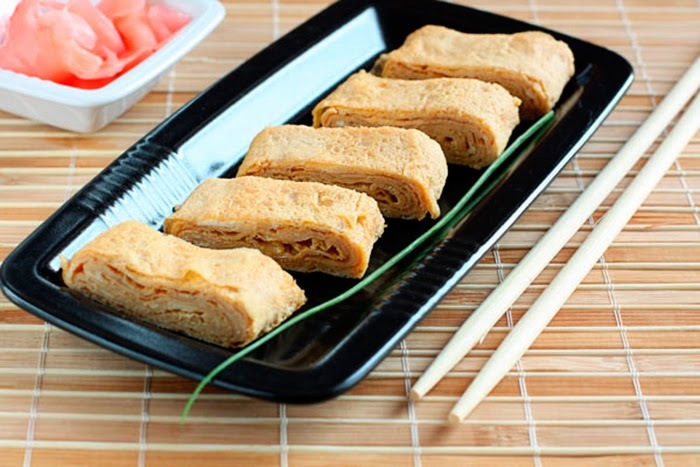 Japanese omelet also has a simple form and challenging content. It’s best to cook it in a square pan, but you can do the usual pancakes. The main thing is that pan should have good coverage and low bumpers. • Eggs – 3 pcs. Mix eggs, soy sauce and rice vinegar (also you can use sake). If sauce is salty – add a bit of sugar (1/3 tsp. ), and if it is sweet – salt it a little. Beat the mixture with a fork until smooth. Preheated on the medium heat pan pour a little of egg and create a thin pancake. Fold two opposite edges to the center when the eggs are grabbed. Then fold the pancake lengthwise. Move the resulting package to the edge of the pan, and pour the free part of another portion of the egg mixture. New pancake should stick with one end of the first. When the second pancake cooked, screw it to the first. Do the same to the end of mixture. Cut across omelet and serve.